We posted the organizer's stage 20 report with the stage results. 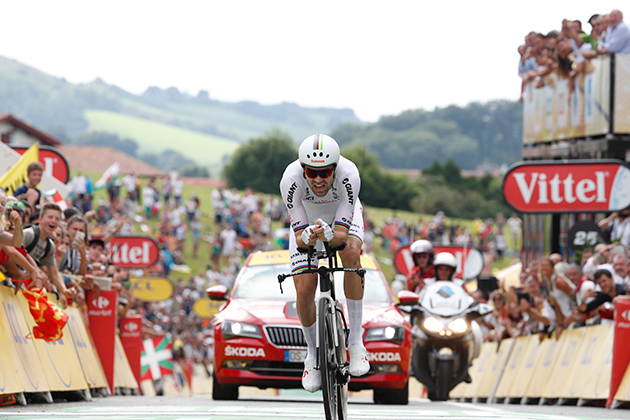 Team Sunweb's Tom Dumoulin (NED) has stormed to the victory at the penultimate stage of the Tour de France, the 31 kilometre time trial set to shake up the overall standings once more. He finished the test in 40 minutes and 52 seconds, with his GC position now second. Dumoulin said: "That was crazy! I can't believe it. I still thought Froome was one second ahead when I crossed line. It has been an amazing last day, I was so nervous. I had such a hard time yesterday, but today it has just been great to take the stage win." Geraint Thomas put in a resounding final time trial to all but secure an incredible Tour de France victory. The Welshman set the third quickest time on the final day of general classification racing and will arrive in Paris on Sunday with the yellow jersey on his shoulders. Overcome with emotion at the finish in Espelette, Thomas will now take a margin of one minute and 51 seconds into the French capital on Sunday, en route to a maiden Grand Tour victory. With Team Sky now set to claim a sixth Tour de France victory and fourth Grand Tour victory in succession, a special day was compounded by Chris Froome, who powered back onto the overall podium. The four-time Tour winner will stand next to his friend and teammate Thomas in Paris after securing third place overall, overturning a 13-second overnight deficit with a commanding ride in the 31-kilometre TT. Froome also came within a whisker of winning the stage, but was narrowly edged out by Tom Dumoulin (Team Sunweb) by a single second. Michal Kwiatkowski spent much of the stage on the hot seat after a strong early ride. The Pole held on for fourth quickest time, 50 seconds back on Dumoulin. “I felt good, I felt strong, I felt really good actually and I was pushing a bit hard on the corners and [Sport Director] Nico Portal told me to relax, take it easy and just make sure I win the Tour. And that’s what I did – it’s overwhelming. I thought I could beat the guys here, but to do it on the biggest stage of all, over three weeks. That’s insane. Basque cycling fans packed the roads on today’s 31km Individual Time Trial to catch the Tour de France before it heads to the Champs Elysées tomorrow. While the GC riders were still fighting amongst themselves to take time on the last day before the procession to Paris, the time trial specialists finally had a chance to show their strengths. The rolling profile in the Basque Country made it tough for the pure time trial riders, but this didn’t stop them from pushing as hard as they could. With the whole team safely in, and Rafał Majka making the most of the hilly course to post the fastest time of the BORA-hansgrohe riders, it was just the final stage into Paris to go, after one of the most difficult editions of the Tour de France in recent years. After 19 stages of racing against each other, on the penultimate day of the 2018 Tour de France, it was to be a race against the clock. The Tour’s only Individual Time Trial would take place on the rolling hills of the Basque Country in southwest France, starting in the town of Saint-Pée-sur-Nivelle and finishing in Espelette, 31km later. The parcours was far from flat and would make riders push hard from the start, with the climbing starting in the first kilometre and the undulating profile making it hard to find a rhythm. Riders would need to measure their efforts expertly, given that they would be exhausted from three hard weeks of racing, while also making sure they took into account that this course had a sting in its tail. While less than a kilometre in length, the Col de Pinodieta’s average gradient, at 10.2%, was going to require a huge effort to overcome before the descent to the finish. This definitely wasn’t going to be a day for the pure time trial riders. It was bound to be a tough day, with both fatigue and the difficult profile likely to influence how the team would perform today. 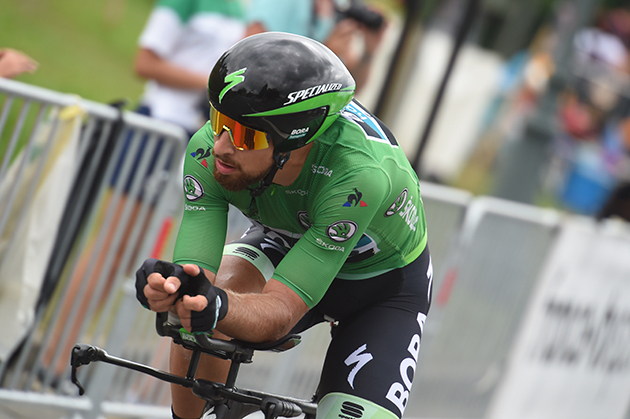 As one of the first riders on the course, BORA-hansgrohe’s time trial specialist, Maciej Bodnar, would be giving it his all today after riding hard on previous stages in support of Peter Sagan, but the forecast suggested the weather could turn later in the day, meaning riders would have to be careful and stay safe on the downhill sections, rather than pushing hard for a fast time – it would be more important to finish safe to be able to ride into Paris than to risk it all so late in the race. Proudly wearing the skinsuit of Polish National Time Trial Champion, Maciej Bodnar was one of the first riders on the course. While the course wouldn’t favour Bodi’s riding style, he would give this effort his all, as well as passing on information to his BORA-hansgrohe teammates about how the route was riding today. He crossed the line, finishing in a time of 44’27”. It was clear that the humid conditions were going to something to consider as the day went on, particularly as rain dampened sections of the course. Crowds packed the roads, and a huge cheer went up when the UCI World Champion, Peter Sagan, started his run. The Slovak rider was still recovering from his injuries, but looked slightly more comfortable on the climbs, conquering the Col de Pinodieta before pushing on to the finish, taking 48’03” on the line. On a course that suited the more able climbers, Rafał Majka was the fastest BORA-hansgrohe rider, coming in with a time of 42’50”. 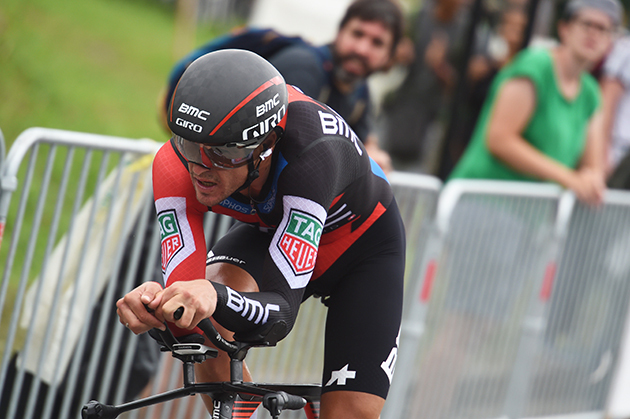 28 July, 2018, Espelette (FRA): Stefan Küng was BMC Racing Team's best-placed rider on Tour de France stage 20 today after a strong performance on a tough time trial course saw him finishing just outside the top ten on the penultimate day of racing. Before reaching the iconic backdrop of the Champs-Élysées tomorrow, the riders faced one more challenge at this year's Tour de France, an undulating 31km individual time trial from Saint-Pée-sur-Nivelle to Espelette which, with 3km to go, went over the top of the Col de Pinodieta, a short 900m long climb with an average gradient of over 10%. As soon as Küng started his effort, he immediately showed his time trialling prowess by posting the provisional third-fastest time at both the first and second intermediate checkpoints, which came after 13km and 22km respectively. The current Swiss national time trial champion pushed himself from start to finish on the tough parcours and eventually stopped the clock at 42'18" which, after the General Classification contenders began to roll off the ramp, was enough to see him secure 12th, 1'26" behind stage winner, Tom Dumoulin (Team Sunweb). Damiano Caruso also put in a determined effort out on the course to cross the line in 42'23" which saw him finish 13th on the stage and move up into the top twenty overall. "It was really, really hard. We are in the Basque Country and when you look at the other races that are held here like Tour of Basque Country and San Sebastian, it's always light, punchy climbers who are up there. So, I guess it's also a course for them today and that's not quite my type of rider. Anyway, I gave it all I had and I think I couldn't have gone any faster today so I'm pretty happy. In the end, there is not much you can do and you just do your own thing and try to go as fast as possible. At the end of the Tour de France, it is always pretty difficult and yesterday with the neutral, we were six and a half hours on the bike so for sure it's not the same when you are going into a time trial fresh. But, compared to last year I felt better today so I take it as a step in the right direction." "It has been a really nice Tour de France for me. To spend eight days in the yellow jersey is something special. I was really happy with my first week. In the second, I was in the breakaways and tried to give as much as possible. Then, the last week was pretty hard in the mountains and now I am happy that we are heading to Paris. We will see how it goes tomorrow. There is a chance that there is an open sprint but there are also a lot of teams interested especially the French teams with Cofidis and Groupama-FDJ who have good sprinters and who will try to keep the pack together. We will try to do something but in the end, I will be happy that the race is over."